Hindu Kush has been a favourite of oldschool indica lovers since its release over two decades ago. Classics which have stood the test of time, as Hindu Kush has, are obvious and rewarding candidates to combine with the cutting edge of cannabis breeding technology. Hindu Kush Automatic is a perfect example of having the best of both worlds in your growroom. Hindu Kush has always rewarded growers of all levels of experience with its reliable growth pattern, and this new Automatic expression just made producing successful harvests of top quality indica even easier. A pure indica strain, Hindu Kush was bred, and has been carefully preserved, within its own gene pool. A favoured ruderalis cultivar has now been combined with the original to create Hindu Kush Automatic. The real appeal of Automatic strains lies in their no-fuss, low maintenance growing requirements. Medicinal cannabis growers especially will appreciate how much less work and effort is needed to get great results. Regular Hindu Kush is a strain recommended for beginners because it has a short flowering time and is easy to control, as well as being robust enough to bounce back from basic growing mistakes. Hindu Kush Automatic takes that resilience and reliability and makes it even more potent. There is no need to identify and remove males, no fear that they will pollinate the rest of your plants if you miss one; these cannabis seeds are bred to all flower as females. And there is no need to change the lighting cycles, or even worry about light pollution! This autoflowering expression of Hindu Kush takes full advantage of its ruderalis component to commence flowering once the plants develop their first few sets of leaves. Look forward to a blooming time of just a few weeks, making it possible to produce multiple crops per year in the same grow space. Hindu Kush Automatic plants will remain short and bushy. People with limited ceiling height will definitely benefit from the compact growth structure. The stubby lateral branches make this cannabis seed strain very well suited to techniques such as Sea of Green, Screen of Green, and lollipopping. It also does very well outdoors in areas that are warm and sunny with long hot summers. If grown outside in free soil rather than pots, Hindu Kush Automatic will show a little more height gain and longer lateral branches. However, it will not become a very tall plant, so if you need a strain that will remain quite subtle in your outdoor garden and is sure to finish before the weather turns cold, Hindu Kush Automatic is a great choice. Hindu Kush Automatic provides a smooth, long-lasting stone that imparts tranquillity and mellow calm rather than being a complete couchlock. Many medicinal users recommend it for stress before pain relief, although it can definitely help with the latter as well. It is also effective against muscle tension and insomnia. It is rare that Hindu Kush will cause anxiety or paranoia in users, so it is recommended as a strain for novice consumers as well as novice growers. Some people find that Hindu Kush Automatic actually enhances focus and steady creativity. Unlike the flights of fancy and inspiration associated with sativa strains, Hindu Kush can actually aid study. It can also make repetitive or domestic tasks more fun, if you do not over-indulge! The flavours of Hindu Kush Automatic are very similar to those of the original. The earthy notes of strains native to that mountainous border region are very evident, and the sweet pungency of charas can also be detected. There are topnotes of sandalwood and incense, though they are not overwhelming, lending a pleasant sweetness to the classic earthy flavours. With some plants, an afternote of pine can be detected. During the growth period there is not much odour from the plants; as they begin to flower, this will change. The smell remains quite subtle until the final stages of flowering, however. Once cured, the flavour and aroma of the dense, tight buds blossoms into a deeper and far more pungent version of the initial scent. 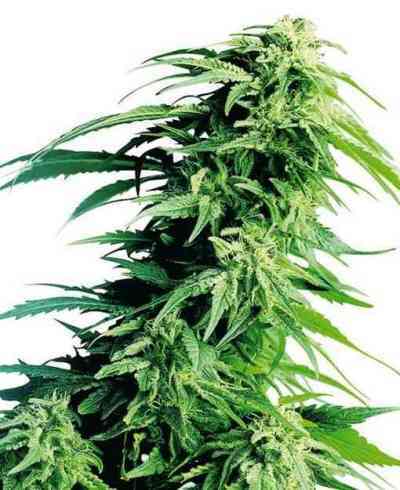 If you are looking for cannabis seeds for a fast, short, low maintenance crop with the great qualities of mountainside indica, Hindu Kush Automatic is a great choice. This modern redux of an award winning classic delivers a smooth high and a dependable performance. Affordable, easy and ready in almost record time, this is a great choice for beginners and medicinal growers.